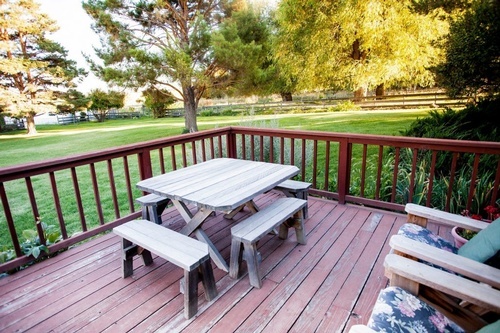 Cabins available May through October. Other dates may be available upon request. 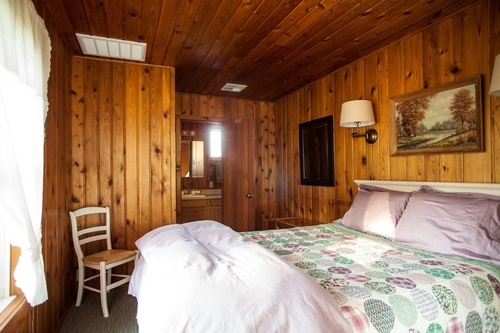 The historic Arrowhead Ranch has two knotty pine cabins available for guests. Built in 1890 as ranch wagon houses, they were extensively remodeled into ranch-hand bunkhouses in 1950 and modern guest cabins in 1995. Each sleeps four people comfortably and has a living room, bedroom and bath, and a full service kitchen. 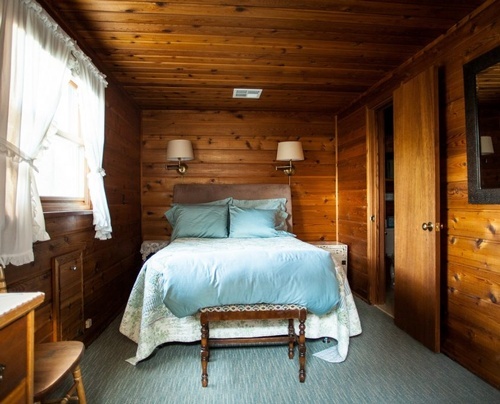 The immaculately clean and well maintained cabins are furnished for relaxed comfort with overstuffed chairs, cotton bed linens, quilts and down comforters. 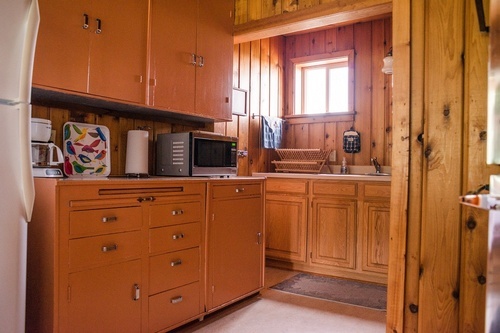 The kitchens are equipped with a full set of pots and pans, dishes, and utensils. 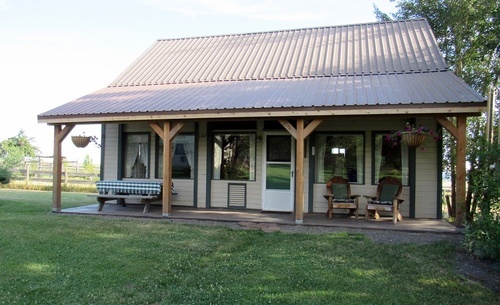 A geothermal heat pump system keeps the cabins toasty warm on cool nights and comfortably cool on hot summer days. 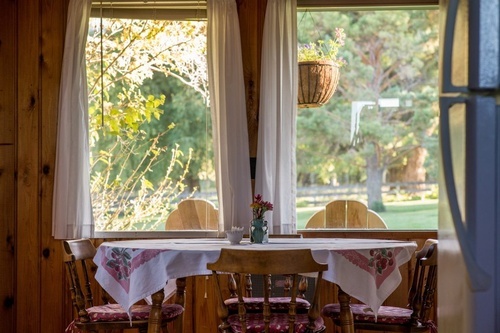 Located in a quiet ranching area approximately 3 miles from the towns of Joseph and Enterprise, Oregon, and approximately 6 miles north of beautiful Wallowa Lake is the perfect getaway. The historic Arrowhead Ranch, once known for prize hereford cattle and quarter horses, sits at the foothills of the spectacular Wallowa Mountains. It is also near the entrance to Hells Canyon Recreational Area and the Zumwalt Prairie, North America’s largest remaining grassland of its type. The cabins sit in the ranch’s park-like atmosphere between the main ranch house and the historic peg-constructed barn. 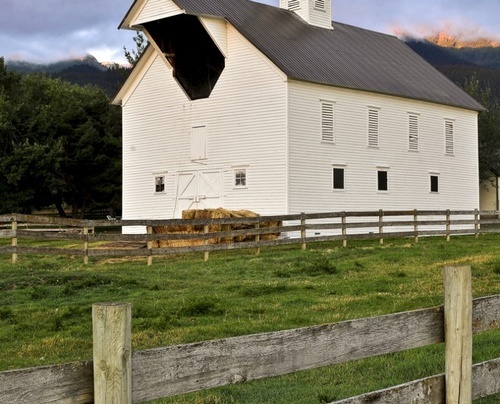 The barn, built in 1888, was featured on the cover of “Country Extra” magazine and has been on the Wallowa County Barn Tour for a number of years. 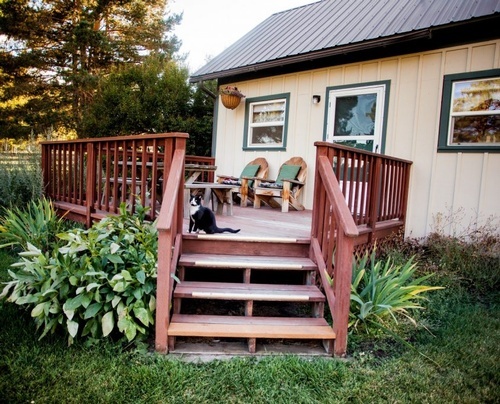 The cabins are ideal for a quiet mountain vacation, small group or family reunions. From Enterprise, turn right on Hurricane Ck Rd., (just after Dollar Stretcher Market), Go ~2 1/2 miles turn right on Langston Ln then right on Pine Tree Rd, 2nd ranch house on right.